USES: Sulfasalazine is used to treat a certain type of bowel disease called ulcerative colitis. This medication does not cure this condition, but it helps decrease symptoms such as fever, stomach pain, diarrhea, and rectal bleeding. After an attack is treated, sulfasalazine is also used to increase the amount of time between attacks. This medication works by reducing irritation and swelling in the large intestines. In addition, delayed-release tablets of sulfasalazine are used to treat rheumatoid arthritis. Sulfasalazine helps to reduce joint pain, swelling, and stiffness. Early treatment of rheumatoid arthritis with sulfasalazine helps to reduce/prevent further joint damage so you can do more of your normal daily activities. This medication is used with other drugs, rest, and physical therapy in patients who have not responded to other medications (salicylates, nonsteroidal anti-inflammatory drugs-NSAIDs). OTHER USES: This section contains uses of this drug that are not listed in the approved professional labeling for the drug but that may be prescribed by your health care professional. Use this drug for a condition that is listed in this section only if it has been so prescribed by your health care professional. This medication may also be used to treat another type of bowel disease called Crohn's disease. HOW TO USE: Take this medication by mouth after meals with a full glass of water (8 ounces or 240 milliliters) or as directed by your doctor. To prevent stomach upset, your doctor may recommend a slow increase in your dosage when starting treatment. Dosage is based on your medical condition and response to therapy. In children, dosage is also based on weight. If you are taking the delayed-release tablets, swallow them whole. Do not crush, chew, or break the tablets. Doing so may increase the chance of stomach upset. Drink plenty of fluids during treatment with this medication unless otherwise directed by your doctor. This will help prevent kidney stones. Take this medication regularly to get the most benefit from it. To help you remember, take it at the same times each day. Inform your doctor if your condition does not improve or if it worsens. For the treatment of rheumatoid arthritis, it may take 1-3 months before you notice any improvement in your symptoms. SIDE EFFECTS: Stomach upset, nausea, vomiting, loss of appetite, mouth sores, headache, dizziness, or unusual tiredness may occur. If any of these effects persist or worsen, notify your doctor or pharmacist promptly. This medication may cause your skin and urine to turn orange-yellow. This effect is harmless and will disappear when the medication is stopped. Rarely, delayed-release tablets of sulfasalazine may appear whole or only partly dissolved in your stool. If this occurs, tell your doctor immediately so your treatment can be changed. Remember that your doctor has prescribed this medication because he or she has judged that the benefit to you is greater than the risk of side effects. Many people using this medication do not have serious side effects. This medication may cause temporary male infertility. This effect is reversible when the medication is stopped. Tell your doctor immediately if any of these unlikely but serious side effects occur: sun sensitivity, hearing changes (e.g., ringing in the ears), mental/mood changes, painful urination, blood in the urine, change in the amount of urine, new lump/growth in the neck (goiter), numbness/tingling of the hands/feet, signs of low blood sugar (e.g., hunger, cold sweat, blurred vision, weakness, fast heartbeat). This medication may rarely cause very serious allergic reactions (e.g., Stevens-Johnson syndrome), blood disorders (e.g., agranulocytosis, aplastic anemia), liver damage, and nerve/muscle problems. Seek immediate medical attention if you notice any of the following symptoms: skin rash/blisters/peeling, itching/swelling (especially of the face/tongue/throat), severe dizziness, trouble breathing, chest pain, signs of infection (e.g., fever, chills, persistent sore throat), easy bruising/bleeding, severe tiredness, muscle pain/weakness (especially with fever and unusual tiredness), pale or blue skin/lips/nails, new/worsening joint pain, confusion, persistent/severe headache, unexplained neck stiffness, seizures, signs of liver problems (e.g., persistent nausea/vomiting, severe stomach/abdominal pain, yellowing eyes/skin, dark urine). This is not a complete list of possible side effects. If you notice other effects not listed above, contact your doctor or pharmacist. In the US - Call your doctor for medical advice about side effects. You may report side effects to FDA at 1-800-FDA-1088. In Canada - Call your doctor for medical advice about side effects. You may report side effects to Health Canada at 1-866-234-2345. 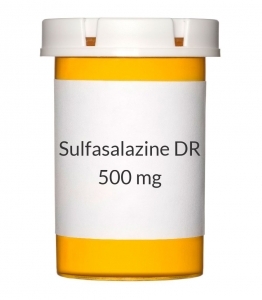 PRECAUTIONS: Before taking sulfasalazine, tell your doctor or pharmacist if you are allergic to it; or to sulfa drugs; or to aspirin and related drugs (salicylates, NSAIDs such as ibuprofen); or to mesalamine; or if you have any other allergies. This product may contain inactive ingredients, which can cause allergic reactions or other problems. Talk to your pharmacist for more details. This medication should not be used if you have certain medical conditions. Before using this medicine, consult your doctor or pharmacist if you have: intestinal blockage, urinary blockage, a certain blood disorder (porphyria). Before using this medication, tell your doctor or pharmacist your medical history, especially of: kidney disease, liver disease, blood disorders (e.g., aplastic anemia), a certain genetic condition (G6PD deficiency), asthma, severe allergies. This drug may make you dizzy. Do not drive, use machinery, or do any activity that requires alertness until you are sure you can perform such activities safely. Limit alcoholic beverages. This medication may make you more sensitive to the sun. Avoid prolonged sun exposure, tanning booths, and sunlamps. Use a sunscreen and wear protective clothing when outdoors. This medication is similar to aspirin. Children and teenagers should not take aspirin or aspirin-related medications (e.g., salicylates) if they have chickenpox, flu, or any undiagnosed illness, or if they have just been given a live virus vaccine (e.g., varicella vaccine), without first consulting a doctor about Reye's syndrome, a rare but serious illness. During pregnancy, this medication should be used only when clearly needed. Caution is advised if this medication is used near the expected delivery date because similar drugs may cause harm to a newborn. Discuss the risks and benefits with your doctor. If you become pregnant while taking this drug, contact your doctor immediately. This medication may lower your folic acid levels, increasing the risk of spinal cord defects. Therefore, check with your doctor to make sure you are taking enough folic acid. Prenatal care should include tests for spinal cord defects. This drug passes into breast milk and could have undesirable effects on a nursing infant. Consult your doctor before breast-feeding. DRUG INTERACTIONS: Your doctor or pharmacist may already be aware of any possible drug interactions and may be monitoring you for them. Do not start, stop, or change the dosage of any medicine before checking with them first. This drug should not be used with the following medication because very serious interactions may occur: methenamine. If you are currently using the medication listed above, tell your doctor or pharmacist before starting sulfasalazine. Before using this medication, tell your doctor or pharmacist of all prescription and nonprescription/herbal products you may use, especially of: cyclosporine, digoxin, folic acid, PABA taken by mouth, phenytoin. This document does not contain all possible interactions. Therefore, before using this product, tell your doctor or pharmacist of all the products you use. Keep a list of all your medications with you, and share the list with your doctor and pharmacist. OVERDOSE: If an overdose is suspected, contact your local poison control center or emergency room immediately. U.S. residents should call the U.S. National Poison Hotline at 1-800-222-1222. Canada residents should call a provincial poison control center. Symptoms of overdose may include: severe stomach/abdominal pain, persistent vomiting, extreme drowsiness, seizures. NOTES: Do not share this medication with others. Laboratory and/or medical tests (e.g., complete blood count, liver and kidney function tests) should be performed periodically to monitor your progress or check for side effects. Consult your doctor for more details.